Welding goes right back to the Bronze Age, but we’ve never stopped refining this simple process of fusing two materials together. Throughout time, the method has remained fairly consistent: you shape a base metal and add filler material to form a new join, usually one that is stronger than the base material itself. Far from the distant struggles of pre-history, the modern man has a wealth of welding processes available, but one of the most popular and versatile is MIG welding. Where and when should MIG Welding be used? MIG stands for Metal Inert Gas, although the more technical name, which you’re particularly likely to encounter on the American side of the pond, is Gas Metal Arc Welding (GMAW). More informally, you’ll often hear it referred to by the slang term “wire welding”. When first developed, it was called Gas Metal Arc (GMA), but you’re unlikely to hear that name knocking around outside of some very outdated manuals. Electrode wiring to produce filler metal. Shielding gas to prevent reactions with the air. Firstly, a thin electrode wire is continuously fed through a flexible tube – known as a conduit liner – from a spool that is either mounted on the gun or inside the welding machine, coming out at the nozzle of the welding gun at a steady rate. Secondly, shielding gas stored in a high-pressure cylinder is passed through a regulator to reduce its pressure and then sent through a gas diffuser and out through the nozzle. Thirdly, the welding current is switched on from the machine. Here’s a quick overview of the purpose each action serves. When a MIG welder is activated, an electric arc forms between the wire electrode and the metal you’re working on, which we’ll refer to as the work piece. The electric charge creates a short circuit between electrode wire and work piece, causing both metals to heat up beyond their respective melting points. They melt together into the weld pool, coalesce, and then solidify into a single piece. The metal from the electrode is known as the filler material, while the metal from the work piece is dubbed the base metal. Because the electrode is slowly used up as you weld, MIG welding is said to use a ‘consumable electrode’. To better understand the term, it’s helpful to consider TIG (Tungsten Inert Gas) welding. A tungsten electrode with an extremely high melting point is used. The tungsten sits in the gun much like the wire of a MIG welder, and it also becomes extremely hot. However, it never melts to become part of the weld pool – as such, it’s a non-consumable electrode. 9 times out of 10, a MIG welder’s shielding gas is composed of argon and carbon dioxide, and its purpose is simply to protect the weld pool from contamination. Without it, the molten metal would react with oxygen, water vapour, and other elements in the atmosphere, resulting in a poor bond. Your MIG welder’s trigger is merely an on-off switch – you’ll find all the machine controls on the machine itself, including wire speed, polarity, and, most importantly, voltage. One of the peculiarities of MIG welding is that the process uses D/C (Direct Current) power, just like the battery you have in your car. The electrode wire is almost always positive, while the work piece will be negative. Current needs to flow in a complete circuit, going from machine, to gun torch, to work piece, and then back to the machine, so a work lead needs to be clamped between machine and work piece to complete the circuit. MIG welding is unique in having one standard voltage and polarity type. Voltage settings are used to set the machine, with the amount of voltage varying according to numerous diverse factors. These include joint configuration, wire diameter speed, metal thickness, and the type of metal. Where & When Should MIG Welding Be Used? To review, MIG welders feed through a wire electrode that forms a short circuit with a work piece to heat each metal beyond its melting point, with shielding gas preventing any contamination. All well and good, so when should you actually use a MIG welder? To sum up, MIG welding is relatively easy to learn, doesn’t take very long or cost much money to complete, and is both safe and versatile. Of course, you can’t move MIG welders around too easily thanks to those cumbersome cylinders of shielding gas, and you can’t stray too far from the machine. Furthermore, don’t expect to work wonders with any thick steel – MIG welders will struggle to achieve the proper penetration. With those characteristics in mind, it should come as no surprise to learn that MIG welding tends to be the preferred process among enthusiastic DIYers, artists, and motorsports devotees. To boil things down further, MIG welding is ideal for those who want something finer and more manageable than stick welding without the added expense and steeper learning curve of more advanced processes. You can buy a MIG welding machine for only a few hundred pounds, then keep it tucked away in your garage and use it for anything from engine repair to basic metalwork. Let’s start from the top and work our way through each variable. The most common shielding gases you’ll encounter are argon, helium, carbon dioxide, and oxygen. Each gas comes with its own associated pros and cons, but a mix of 75% argon/25% carbon dioxide generally works as a strong all-rounder. Splatter is minimal, bead appearance is good, and it won’t burn through thinner metals. The vast majority of amateur welders won’t need to stray from this dependable mix, but it’s still worth considering the characteristics and common uses of each gas. Carbon dioxide is the only element that can be used without the addition of an inert gas. It’s good for deep penetration into thicker materials, but the arc isn’t as stable, the splatter is greater, and the bead is rougher than with an argon/carbon dioxide mix. On a positive note, it’s a remarkably cheap gas. Oxygen is generally used at around 9% to boost weld pool fluidity, arc stability, and penetration, particularly when dealing with low alloys, stainless steel, or mild carbon. Avoid magnesium, copper, and aluminium when using oxygen in your gas mix – you’ll risk the oxidation of the weld metal. Argon delivers sharper and narrower penetration, and is used for welding your non-ferrous metals – think magnesium, aluminium, and titanium. Helium can also be used with non-ferrous metals, as well as with stainless steels, and it works perfectly in concert with thick metals thanks to its deep penetration profile and hotter arc. However, it’s relatively expensive as shield gases go, something to only use when you really need it. 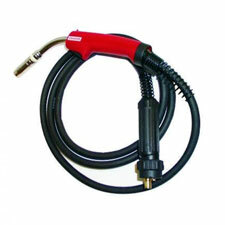 The welding gun directs your electrode wire, transfers current, and provides the shielding gas. It’s clearly a vital piece of kit that comes in quite a few variations. The broadest distinction is between air-cooled and water-cooled, so here’s a quick breakdown of each type. Air-Cooled: Shield gases pass through the body of the gun, cooling the nozzle as they do so. The cable needs to utilize a lot of copper to cope with this process, so air-cooled guns will be heavier and less flexible than water-cooled guns. That said, they’re also appreciably less pricey since no extra hoses or independent cooling systems are required, and the simpler design makes them easier to assemble, operate, and maintain. A wide range of amperes tends to cover between 150 and 600 amps. Water-Cooled: An independent radiator cooling system circulates water, ambient air, and shielding gas. Water-cooled guns are lighter and more flexible than air-cooled guns, and they dissipate heat more effectively, but they’re also pricier and harder to maintain. Amperes typically range between 300 and 600 amps. Water-cooled systems offer reduced downtime, and the consumables will last longer, while air-cooled guns are advantageous for lighter work. As a general rule of thumb, air-cooled guns are great for infrequent use and portability; water-cooled guns are ideal for those who plan to weld more and are willing to trade some ease-of-use for added comfort. Push-Pull: A push motor allows the wire to feed through with minimal resistance, so you can weld further away from your power source. Spool: Particularly useful when working with aluminium, spool guns improve the feeding of softer wire, only moving it a few inches before it encounters the weld puddle. Fume Extraction: Adding an extra line of defence against potentially harmful fumes, these capture gases right at the tip of the gun and then channel them through an extraction system. That’s great when dealing with some stainless or galvanized steels, or where wires and steels contain lots of manganese. Ampere Ratings: A 600-amp gun will cover all needs, but it will be very heavy and cost a lot to run. Going with a 150- or 200-amp gun will reduce price and weight, but it won’t be able to handle heavy-duty work. Assess your needs before taking the plunge. Triggers: Standard, locking, and dual pull triggers are available, and being able to move between them increases productivity. Neck and Handle: Rotary necks let you weld at various angles, while flexible necks allow you to move between various positions. Consider something lightweight if you’ll be working for longer periods. Your ground clamp connects the work piece to the machine, completing the vital D/C circuit. Longer cables get tangled easily, while shorter and lighter ones are relatively easy to manoeuvre. A longer cable should only be deemed necessary when large pieces of metal are being worked with or lots of movement is required. And it doesn’t matter how long or thick your cable is – you always need to check that it can handle the amps your machine puts out. One of MIG welding’s attractions is its safety, at least compared to most other welding processes. However, you’ll still need to protect yourself by donning the correct safety wear and using the right safety equipment. 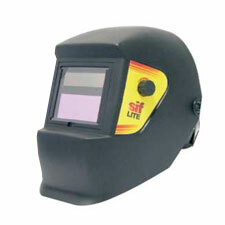 Use a welding mask with a lens rated at the appropriate number for the amps you’ll be working with. If you close your eyes right after welding and can still see the arc, you need to go for a darker lens before starting up again. If using oxygen as part of your shielding gas mix, a lens that absorbs yellow will be advantageous. You’ll also want to wear protective clothing. Clothes should fit tight, be hard-wearing, and be made from a non-flammable material. Leather gloves protect your hands and steel-capped boots protect your feet. Long hair should be covered – bandanas and skull caps are useful with that goal in mind. Though not essential, you should consider investing in a fire extinguisher and keeping it close to hand. One of the central strengths of the MIG welding process is that it can work with most metals and metal alloys. The most common are carbon steel and stainless steel, though aluminium is also welded using the MIG process. 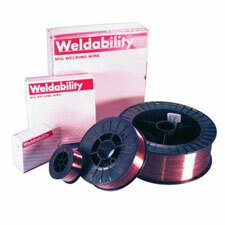 As a general rule, the electrode wire should be of the same type of metal as the work piece. Some wires are manufactured with additional elements, such as manganese, silicon, and titanium, which make it more stable. You’ll need to select the right thickness, which means checking the thickness charts provided by your manufacturer. The information provided above should have you ready to start MIG welding, but don’t forget to respect the learning process. It’s an easy enough skill to develop, but you should start by following this step by step guide. Inspect Cable Connections: Look for any visible signs of damage and make sure all cables are connected with a tight fit. Turn on the Shielding Gas: Set the flow rate between 20 and 25 cubic feet per hour. If there are any signs of a leak, apply soapy water and check for bubbles. Inspect the Wire: Remove any excess spatter from contact tubes and replace worn contact tips. If there is rust, dirt, or oil, use a metal brush to grind it away. Inspect Your Work Piece: The section of the work piece where your work clamp attaches must be similarly free from rust, dirt, and oil. If not, time to break out the metal brush once again. Don’t start until the area is spotless. After making those checks, grind or file a slight bevel along the edge you’ll be working to ensure the deepest possible penetration. Take the opportunity to practice running a bead by making a straight line across a piece of scrap metal. This should give you a feel for the settings and indicate if they need to be changed. Too little power will spatter the meld and fail to penetrate; too much will melt right through. Start by laying beads an inch or two long, making small zig-zag motions with the tip of the welder. Make the same zig-zagging movement while you weld your metal. It helps to weld from bottom to top, although any direction that is comfortable should be fine. Sometimes you won’t mind how the weld looks, but it’s far from rare for appearances to matter. Even if they don’t, it’s worth practicing this step. Achieving a more pleasing appearance means grinding down and smoothing out. Use an angle grinder to start the job, being careful not to go through the weld or gouge any of it away. Keep moving slowly and steadily as if using a sander. Make sure your unit is unplugged, and then feed the wire through the rollers. Once you turn the machine back on, depress the trigger until the wire protrudes from the gun’s tip. How Do You Weld Safely? Safety deserves its own section. It’s worth repeating yet again that the relative simplicity of MIG welding doesn’t mean that the process is without hazards. Learning how to weld properly should have removed most of them, but no level of skill or experience can act as a substitute for the right safety equipment. ‘Arc flash’, which normally causes burning sensations or eye irritation, can result from even brief exposure to arc radiation – repeated exposure could mean permanent damage. That’s why face and eye protection is so crucial. Auto-darkening shields are ideal, though fixed-shade lenses can be fine in their own right. Pick the right tint level to protect against the amps you’re using. Helmets should be made in a cut-away shape that protects the shoulders and upper chest as well as the face and eyes. You’ll want one that can be worn with a respirator without creating discomfort. Industrial hygienists will take readings of the air when you’re working on a commercial project. If you’re working at home, err on the side of caution by wearing a respirator anyway. Power models are excellent when working long hours on a job that will present a lot of fumes. Valve respirators use zero metal, and it is lung-power alone that moves air in and out. They tend to be cheaper, though they get a little tiring during longer jobs. Sparks and spatter can hit anywhere along your body, and rays, both visible and invisible, can damage your skin. Simply put, you need to cover up, so switch out any shorts or t-shirts for coveralls. They should fit tight and be made from flame-resistant materials. 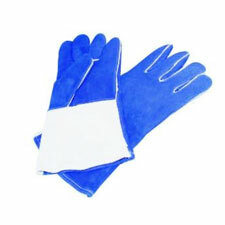 Leather gloves are flame-resistant and able to protect against both sparks and heat. Just be wary of any ‘one-size-fits-all’ gloves – they’re almost certainly going to feel uncomfortable and impair your much-needed dexterity. It’s well worth spending extra for a pair that fit well. Try viewing it as an investment. People often forget about footwear, but sparks and spatter can hit your feet as well as other parts of your body. Footwear should be completely non-porous, made from a material that cannot melt and stick to your skin when subjected to heat. Trainers are out, boots are in.